Heat a large, heavy-bottomed skillet to medium-low. Add oil and let warm up. Add garlic slices and cook, stirring every 15-20 seconds, for 2 minutes. Make sure to keep your eye on the garlic; it can go from toasted and lovely to burnt and bitter in a matter of seconds. Once the garlic is toasted, remove with a slotted spoon and set on a paper towel to drain. Leave the oil in the pan for the next steps. Turn your heat up to medium-high. Add onion and cook until the edges begin to brown, about 5-6 minutes. Add greens and nutmeg (if using); season with salt and pepper. Cook for about 5-6 minutes, until greens wilt. You may have to add the greens in batches to fit them all in the pan. 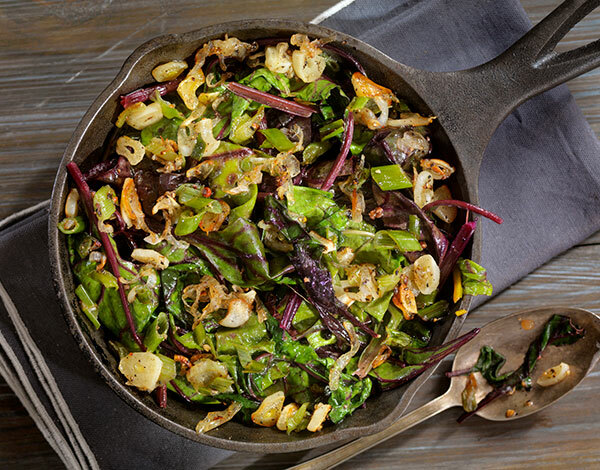 Once greens have wilted, add toasted garlic back in and serve immediately. This healthy and flavorful side dish is a great accompaniment to a piece of grilled meat; toasting the garlic brings out a rich, nutty flavor that is out of this world. We used chard in our version but feel free to swap in mustard or collard greens.